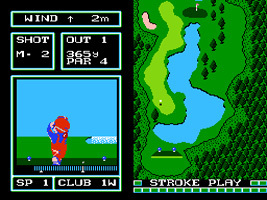 Golfing game starring Mario. Play across a series of greens modelled after Japanese golf courses. Select your club and direction, then use the power meters to determine the accuracy and drive of your shot. Hit the ball into the hole within par. Avoid the sand and water traps that will hinder your progress. A special golden disk version of this game was released as part of a competition in Japan, and contained all-new courses to play. In the options you can read instructions on how to upload your scores to enter the contest. 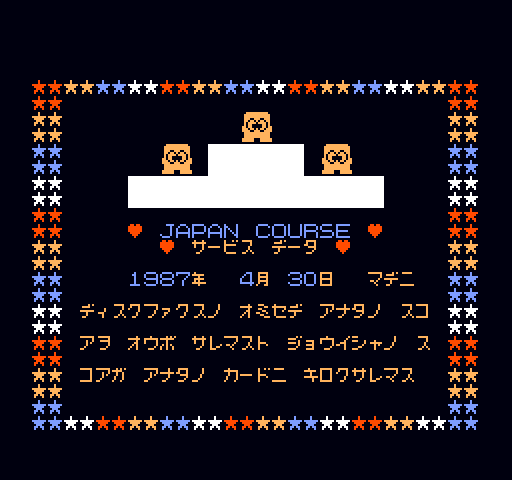 On this screen, you can see three Diskun, the mascot of the Famicom Disk System, standing on a podium.